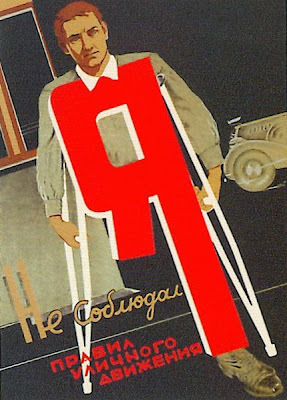 The poster shows a man with an inscribed red Russian letter “Я”, meaning personal pronoun “I” in Russian. The man is on crutches as his leg is lacking. This is why the letter “Я” doesn’t have a lower stroke, symbolizing that the man’s body is incomplete as well as his “self”. Obviously this is due to a traffic accident caused by violation of the traffic code. Actually the man should be happy because in this traffic accident no one was killed or seriously injured except for himself. The traffic code in Soviet times was always quite strict so in case of life losses the liability of the culprit was easily changed from administrative to criminal, with a high chance of imprisonment after investigation and trial.